Keeping your tile flooring clean is an important step in bringing customers back to your establishment. Tile flooring in commercial settings like restaurants, kitchens or public restrooms require deep cleanings on a regular basis along with daily maintenance cleanings in order to look their best. Daily moping gives floors the appearance of being clean but in reality, moping is just spreading the dirt, grease and bacteria over the surface of the floor, pushing it into the porous surfaces of the tile and grout. An effective way to remove the embedded dirt and grime from your tile floors is to have a professional cleaning performed on a regular basis.. With our tile cleaning service, we clean at varying pressure with a surface cleaner while we reclaim the waste water. What this means is, you won’t be left with any residual mess, after your cleaning, just clean floors. Keep your commercial facility looking its best; call Liberty SoftWash at 717-324-4208 to discuss your interior tile cleaning needs. And be sure to visit our website at LibertySoftWash.com to learn about our other services. Why Do I Need A Hinge Kit On My Kitchen Exhaust Fan? Anytime you are cooking in your commercial kitchen, you can be sure that your rooftop fans are working hard. Because the fans are working so hard, they need to be properly cleaned and maintained to insure they continue to do their job properly. Hinge kits also make the task of cleaning the ductwork easier by allowing access to the duct by simply “opening” the fan on its hinge rather than removing the cumbersome fan from its curbing and placing on the roof. Oftentimes, fans that do not have hinge kits installed will not be removed as part of a routine hood cleaning. Neglecting this step in the hood cleaning process can leave the backside of the fan and ductwork with grease build up that will continue to accumulate causing increased risk for fire. Because most owners don’t know what the fan on the roof of their facility looks like, they may not be aware if their fan has a hinge kit. Its up the hood cleaning contractor to make sure the owner knows what is necessary to keep their system up to code. Here is a short time lapse video of a concrete tile roof cleaned by Spray Wash Exterior Cleaning in Tallahassee, Florida. This roof was totally cleaned from a ladder, and our softwash system eliminated the need for walking the delicate Concrete tile roof and causing any damage. Liberty SoftWash took this KEC over two weeks and the last company did a cleaning. We arrived to look at the hood and estimate it and noticed the system dripping grease when the owners came in to prep for their shift. When we were hired we open up the system and began scraping it down to bare metal. Liberty SoftWash will clean and maintain the hood and fan when on site. Dont just hire a hood polisher to make it look pretty hire someone that will clean the WHOLE system. Do you live in Southern Maryland? Do you have those ugly black stains on your roof? Are you wondering if a roof cleaning is an option to replacing it? A new roof is a lot of money. Our non pressure roof cleaning method is priced at around 10% of replacing it. The results are immediate! I'll put a before and after pic at the bottom. Why a non pressure method, to clean the roof, compared to a low pressure method? The Asphalt Roof Manufacturers Association , and Owens Corning (a shingle manufacturer) says there is only ONE way to clean roofing shingles. No pressure AT ALL. That is the method we use. We have been cleaning roofs in Southern Maryland now, for well over 5 years. We offer a 5 year no stain guarantee on complete roof cleanings. We are that confident of our service. The method that we clean your roof, is also called Soft Washing. Give us a call 240-355-1110, ask for Mike, and I would be glad to answer and questions you have in regards to maintaining your roof. Maintaining my roof? What is he talking about? OK, here it is.... (If you already know what that "stuff" is on your roof. What to expect? Scroll down to the next paragraph). Here we go... All of those black stains on the roof? Well, that is a bacteria. Goleo Capsa Magma. Yea, that is what the scientists call it. It is "mother nature" eating your roof, basically. What we have seen over the years is that after the black stain gets a good hold, not always, most times for sure, is that other organisms notice the good home the bacteria has made, for themselves. They want to hang out too!... On your roof!!! What am I talking about? Moss and lichens. These, we cant get rid of same day. They turn white, become brittle and flake off over time, Months maybe? I got off topic a little bit. Maintaining your roof, and Roof Cleaning? What do they have in common? (read the paragraph above). Well, ...clean roofs last longer. I hope you enjoyed my writing skills. Trying to make this an interesting read about Cleaning roofs in Southern Maryland. Lets do some contact info, ... then some pics! Here is a before pic of a roof cleaning in Lusby Md. This roof was caught well before the moss and lichens. Most roof cleaning jobs are like this. Get it before it gets really bad. Your roof. The after pic. ... Give me some love here! I spent about 4 hours writing this, lol! The good ones take that long. I think it's a good one, to get on the first page of Southern Maryland Roof Cleaning search? Love, I mean shares likes comments. After pic, roof cleaning in Lusby. When it comes to roof cleaning Berlin Maryland, look no further than Kendall Roof and Exterior Cleaning. We take the time to do the job right! Our low pressure roof cleaning system allows us to apply our solution at 80 psi, rather than 3000psi. After the solution has been applied, the moss and lichen will turn a white color (as pictured above). At this point, the moss is dead and needs to be removed, only at garden hose pressure will we rinse the dead moss off of your roof! Pocono Non-Pressure Roof & Exterior Cleaning has earned the service industry’s coveted Angie’s List Super Service Award, reflecting an exemplary year of service provided to members of the local services marketplace and consumer review site in 2014. "We are extremely pleased to be a recipient of the Angie’s List Super Service Award. Our staff prides itself on providing free quotes on a timely basis and exceptional work to both our residential and commercial customers alike." Today the Roof Wizard softwashed and restored this cedar shake roof and house in Stone Harbor, NJ. The homeowner is putting the house up for sale in the Fall and wanted it to look it's best. We washed the roof, house, three Mahogany decks, the Travertine tile pool deck, paver driveway and the windows. We used Wood Restore on the roof after rinsing the softwash solution, to neutralize and condition the cedar shakes. The results beyond the homeowners expectations and they will hopefully sell the house easily. The best part of the day was when a local property manager, who only manages million dollar ad higher houses, stopped by and watched our process for three hours. He explained that he has over 30 houses on the island that he is in charge of, and most of them have cedar roofs. Until today, he was basically telling the homeowners that the roofs could not be cleaned safely, without damage. He provided me with 16 addresses for estimates and is looking forward to breaking the great news to the homeowners, that we can clean their roofs. He said the truck wraps caught his eye and then he circled the block to get a better look at what we were doing. The Roof Wizard recently softwashed all the on-site housing, Bruckenthal Hall, at the US Coast Guard Training Base in Cape May, New Jersey. We cleaned five separate buildings, totaling a little over 16,000/SF of EIFS. One of the main reasons we were able to work on this base, is our "Good Stewards" pledge to the environment and our ability to produce MSDS sheets and job specific data sheets. The entire complex had all the windows replaced and re-caulked earlier this year, and they were concerned about using any for of high pressure cleaning. Our softwash process was exactly what the USCG was looking for. The Roof Wizard recently was hired to softwash this multi million dollar home, in Avalon NJ. The homeowner is putting the house up for sale in a few weeks and building another one across the street, about 100' closer to the bay. They had the roof pressure washed 18 months ago and were not happy with longevity or the amount of concrete residue runoff. The owner had to drain their pool after the last cleaning, due to the amount of concrete chunks and red pigment that had run off into it. The Roof Wizard crew was able to minimize and divert the runoff, with our softwash process, which consumes about 1/3 the water of pressure cleaning. We fought the on and off downpours of rain, and the constant 15-25 MPH winds, which is pretty typical on the Jersey Shore. As you can see in the pics, the roof was extremely infested, for just being washed 18 months earlier and the results were a dramatic change. Summer Visitors May Be Knocking At Your Door, Time for Some Pressure Washing! The official beginning of summer is just around the corner. For the residents of Central Pennsylvania, this means summer gatherings, picnics and other outdoor activities that are sure to bring visitors to your home. With the expectation of visitors to your home, now is a great time to take a look around your home to take care of things like trimming bushes, weeding flower beds, planting flowers and also cleaning up your home’s exterior. While a homeowner can accomplish many of these projects, many are simply short on time and choose to call in a professional to get the task done. Liberty SoftWash is an excellent choice for your pressure washing in Pennsylvania including Lancaster, York, Harrisburg and surrounding areas. We clean your home’s entire exterior and all things surrounding your home including; sidewalks, patios, decks, pergolas, patio furniture and more. We offer various types of cleaning processes that ensure we can clean all of your exterior surfaces properly. Soft washing is ideal for surfaces such as vinyl siding, dryvit, stucco, brick and more. While pressure washing is used for hard, flat surfaces like asphalt driveways, and concrete sidewalks or patios. Roof cleaning is another service that can dramatically improve the appearance of your home’s exterior. Soft wash roof cleaning is one of our specialties at Liberty SoftWash. Asphalt shingles, slate roofs, cedar roofs, tile and even metal roofs can all be successfully be cleaned by using the correct technique. We will never pressure wash your roof but instead will use a safe, low pressure cleaning techniques that will remove year of algae growth and return your roof to a like new appearance without the use of a pressure washer or any other high pressure cleaning technique. Our technicians have all gone through training that ensures they are knowledgeable about not only the techniques used but also about the equipment they are using and most importantly about the surfaces they are cleaning. Using top quality equipment, and continuing education about our industry are what makes Liberty SoftWash an excellent choice for all of your exterior cleaning needs. Call 717-324-4208 today to speak with one of our professionals about all of your exterior cleaning needs. Our service area includes: York PA, Lancaster PA, Harrisburg PA, Hershey PA, Lititz PA, Mechanicsburg PA, Carlisle PA, Hanover PA and surrounding areas. We also offer pressure washing services to Commercial customers and business owners in Central Pennsylvania. 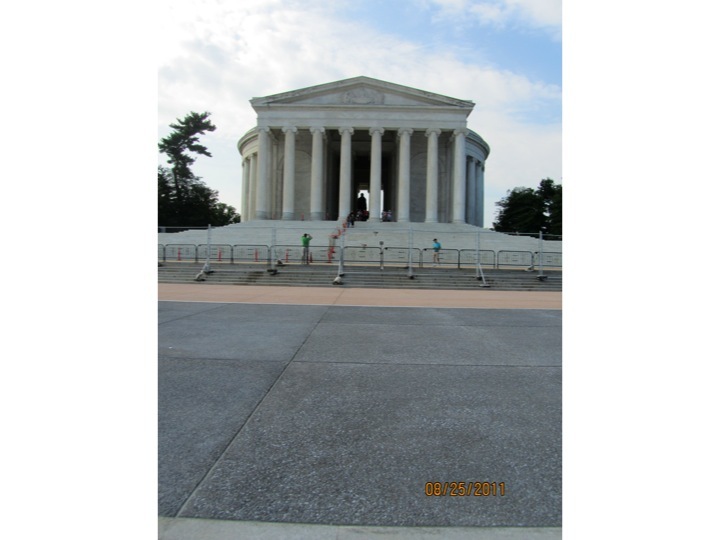 Liberty SoftWash is Certified through the UAMCC (United Association of Mobile Contract Cleaners) in the areas of Roof Cleaning, Hard Surface Restoration and Wash Water Control. This past week the Roof Wizards' crew softwashed a Hilton Garden Inn. It was not that dirty, except for the bottom 5' and around some windows, but Hilton has a franchise agreement that all franchise owners must uphold. The buildings need a professional exterior cleaning every two year, based on region. The owner and GM were very pleased and asked us to quote another five hotels they own. We were in and out in about six hours and did not need the use of a lift. The biggest help was rinsing with fire hose from the hydrants. They are the ultimate booster pumps!! This week the trained and fully insured staff of Pocono Non-Pressure Roof & Exterior Cleaning had pleasure of pressure washing some hard surfaces and soft washing the vinyl sided timeshares of Wyndham Resorts. This 96 unit project is located on the Delaware River in the heart of the Poconos. This project was performed around the arrival and departure of guests. We had to consider both the pedestrian and vehicle traffic, while completely cleaning and sterilizing the vinyl siding of each location. At Pocono Non-Pressure Roof & Exterior Cleaning we service not only resorts but residential and commercial properties as well. Our pressure washing/soft washing methods have made us the leading provider of exterior cleaning throughout the Poconos, the Slate Belt, the greater Scranton/Wilkes Barre area and northwest New Jersey. Whether you need roof cleaning, hard surface pressure washing or soft washing of exterior substrate surfaces we have the knowledge, technology and the proper staffing to assist all property owners. Please feel free to visit our website (www.poconoroofclean.com) or reach out to us at 570-994-6918 for additional information. Tanglwood Resorts, a long established and respected resort nestled in The Poconos on Lake Wallenpaupack contacted Pocono Non-Pressure Roof & Exterior Cleaning to service the their resort. Our staff performed not only the gutter clean outs but the exterior surface cleaning of concrete, gutter faces, and wood clapboard siding. As the leading provider of exterior cleaning in Hawley, PA we soft washed the exterior substrates and pressure washed the concrete floors on the lower level. This is the first of many buildings we are servicing this season for the resort. This week the Roof Wizard's Crews softwashed a corporate office HQ, for Verizon. It was cold, and extremely windy, but we were able to get the project scope of work done in one day. The building was fully functioning and had approximately 1500 people in and out all day, including deliveries to the loading dock and an entire army of Verizon Corporate Officer's in for meetings. It was probably our most difficult job to date, with respect to pedestrian and auto traffic, and dealing with a constant 25 MPH wind. They are having a Corporate party for all the Verizon big wigs here next week, in the courtyards, and wanted the building to shine. 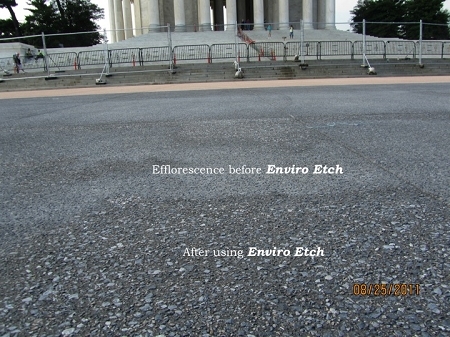 We used a 2.5-3% mix with Green Wash and the results were terrific. Yesterday The Roof Wizard's Crews softwashed the Camden County Police Station building in downtown Camden, NJ. It is a fully functioning police station with over 200 employees in side and the cities Central Booking inside. We started early and only disrupted one door at a time, to allow for flow of constant pedestrian traffic. We softwashed the whole building and cleaned all the windows. We used a 2% mix on three sides and a 3% on one side. One of the biggest challenges was keeping all the windows closed, as the employees inside wanted them open, with nice Spring weather. We were in and out in 6 hours flat and had time for a company lunch outing. It was nice to bond with the guys on a Friday afternoon and talk about things other than work. This past Monday The Roof Wizard and crew help out with the UAMCC "Wash With Us" initiative. To help kick off the UAMCC event in Atlantic City, we donated our cleaning services to softwash the local Police Athletic League. A few other UAMCC contractor also helped out and cleaned the Boys & Girls club, just up the street also. As you can see from the pictures, the building was dirty and in need of a good bath. The building was mostly Dryvit, with some concrete panels and split faced block here and there. It all cleaned up nice and even Senator Jim Whelan stopped out for a visit and to show his gratitude. Wildwood NJ Condo Association Softwashing.. This past week The Roof Wizard's Crews cleaned the exterior of this 12 unit condo complex in Wildwood, New Jersey. Once again, the radically changing Spring weather in the NorthEast was cold (48 degrees) and windy (35 MPH). Typically we can softwash to the top of these three plus story buildings from the ground, but not with those winds. We had to use our SWS water-fed pole attachment to get all the way up, for most of the building. The front of the building with all of the balconies was a challenge. Another issue, with most shore towns, is water pressure. We made fully use of booth booster pumps, which helped us complete the project in just over 8 hours. Last Friday The Roof Wizard's crews softwashed a local winery, Plagido's Winery, which was infested with black mold. I got the call from the owner as a referral from another winery owner, who's building we cleaned last year. He explained that his customers have been commenting on the nasty black mold on the building and he needed a solution. He was very concerned about using too much pressure and had not done a real cleaning, since the winery was opened in 2007. We softwashed the entire building, in two hours, first thing in the morning, so they could open at noon and not cause a disruption in business. We then went next store and softwashed the owner's roof & house. As you can see from the pics below, the winery is clean from the black mold & algae. This house received the full exterior detail. We Soft Washed the Roof and House and a couple of fiberglass decks in the back. This house wash was completely done without the use of pressure washers. When all the cleaning was done we washed the exterior windows to give them a little extra shine. Here is just a small example of the before and after. This afternoon we cleaned approximately 600 solar panels on a strip mall in Voorhees Township, New Jersey. The weather is a little crazy this time of year in the NorthEast and it was a cloudy 44 degrees with rain off and on all afternoon. We typically use DI water and water-fed poles only to clean solar panels, but roughly 100 panels were surrounded by exhaust vents, from a restaurant below. These panels were caked in grease and needed an extra special touch. We used a Terra Wash, applied with our Gilmour Bleach Wash applicator, and let it sit for about five minutes. The we rinsed with DI water and then gave then a final scrub with DI and a water-fed pole. The grease melted right off and they looked new again. Attached are some pics. It worked so well, we went ahead and sprayed the other 500 panels also, before scrubbing. The owner of the strip mall was present and was so impressed, we signed a maintenance agreement for three cleanings a year. He also requested a proposal for the entire strip mall exterior and sidewalks, plus a quote for his house & roof. His house and roof are around 5500/SF. In a slow real estate market, a person can generally sell their home quicker by dropping their asking price. In a market where supply is greater than demand, a desperate seller may see a lower price as their only option to shorten their home’s time on the market. There are however, other things that a seller can do that will help boost their home’s appeal to potential buyers. Some things can be done without costing any money while others may cost a few bucks. In the long run, a few well-spent dollars can end up saving you thousands when you are not forced to drop your asking price in order to make a sale. Some things you can do that can potentially make your home more sellable aren’t done in or around your home. Your realtor can help add some ways to make your home more attractive to buyers. Sellers can often be enticed by things like money towards their closing costs or even entirely covering the closing costs as a way to sweeten the deal in a down market. Other things that can help motivate a buyer include a home warranty or an option to close the sale within 30-60 days. These types of incentives can make you home even more attractive. The very first thing a potential buyer will see is what the home looks like from the outside. A home that doesn’t look appealing from the curb may be overlooked based on nothing other than it’s exterior appearance. Things like planting flowers, adding a fresh coat of paint to the front door or adding a new mailbox are inexpensive ways improve your home’s appearance at first glance. Some would argue that curb appeal is everything and your first impression often sets your expectations on the rest of the home. Another way to increase your home’s curb appeal is by cleaning your home’s exterior. Dirty sidewalks, siding, patios or decks can be an instant turn off for potential buyers. The standard of cleanliness you maintain on your home’s exterior is often measured against your home’s interior cleanliness, when being viewed by potential buyers. A dirty roof may also set off a false alarm telling buyers a roof needs to be replaced and will cost thousands of dollars. Having your roof professionally cleaned will only cost a fraction of the cost of roof replacement. Removing roof algae will dramatically improve curb appeal and eliminate the threat of losing a buyer because of an unsightly roof. Pocono Non-Pressure Roof & Exterior Cleaning completed the gutter cleaning of this ten building 60 unit town house association(North Slope One) based on the bottom of Shawnee Mountain on Hallow Road in East Stroudsburg. As the photos indicate not even snow stopped our dedicated and train staff from completing the work on a timely basis. As many of our customers already know we are here to help both residential and commercial property owners with the exterior cleaning needs. We provide not only gutter cleaning to our customers but a full array of exterior cleaning to include but not limited to non-pressure roof cleaning, soft washing, house washing, pressure washing, exterior rust removal, gutter clean outs, gutter brightening, graffiti removal, gas station and convenience store canopy cleaning, fleet washing, playground sanitation and concrete/sidewalk cleaning. 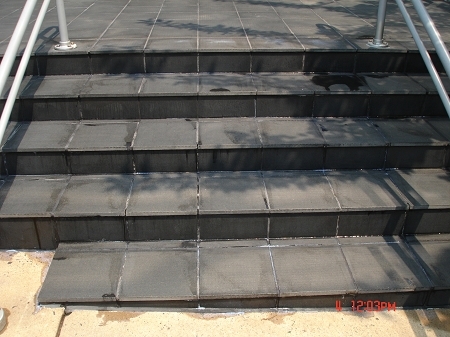 Spray Wash Exterior Cleaning provides extensive maintenance cleaning to several business organizations. These photos and video are form a recent cleaning of a Capital City Bank Group location in Tallahassee Florida. We provide services on this project such as Roof Cleaning, drive-through maintenance, building cleaning and curb/sidewalk washing. Looking for a roof cleaning service in Upper Marlboro Maryland? Do you want the roof cleaning to be done in the safest manner possible, and the cleaning to last the longest? Do you want to see results the same day? GutterDogs uses a safe non pressure method to remove those ugly black stains on your roof. Results you see the same day, and we guarantee it for 5 years. Our method causes no damage to your roof, like pressure washing or "rinsing" the roof does. Why is "rinsing" an important keyword, to watch out for? Some roof cleaning companies who pressure wash your roof try to hide that fact and call it rinsing. What to expect from our roof cleaning. The black stains will be 100% gone. Any moss or lichens on the roof will turn white, become brittle and flake off over time and no granule loss to your shingles. In recent years, we have seen milder winters, which meant the early arrival of both pollen and spring allergies. Because we have had a much longer and colder winter, allergy season may start later and end sooner but, could pack quite a punch to the allergy sufferers in Central Pennsylvania while it is here. Oftentimes, the only way for an allergy sufferer to get some relief this time of year is to stock up on allergy pills and nasal sprays in an effort to minimize the suffering. Asthma sufferers are worse off than the average seasonal allergic person. Because it is typically the early spring that is the worst for asthma, doctors recommend asthmatics begin using their prescribed medications well before spring and spring allergy season begins. For those seasonal allergy sufferers who are not given relief from over-the-counter drugs, it may be necessary to take different measures. Newly available medications including immunotherapy pills work in the same manner as allergy shots have in the past. But there are precautions that can be taken to help ease the impending suffering of a person with springtime allergies in addition to whatever type of medications you would use to treat the symptoms of seasonal allergies. The savvy asthmatic or allergy sufferer will find it helpful to keep track of local pollen counts, which can be found online or by checking your local weather forecast. By keeping track of the pollen counts, it may make it easier to avoid outdoor activities. If it is still necessary to spend time outdoors, it may be most comfortable for allergy or asthmas to do so in the afternoon. Generally, the counts tend to highest between 5AM and 10AM and at their lowest right after a heavy rainfall. But also know that pollen can blow as much as 50 miles, making very difficult to escape! Another way to lessen the suffering from seasonal allergies is to try to keep pollen out of your home environment. Coats, jackets, shoes and hats should be taken off immediately upon entry to your home so help prevent contaminating other parts of your home with pollen that was carried into your “pollen free” living environment. Showering before bedtime to remove any residual pollen is also a necessary step to prevent transfer of pollen to your bedding. Cleaning your home’s exterior is yet another way to keep nasty pollutants such as pollen or algae from triggering allergic reactions. Regular cleaning of your home’s exterior including sidewalks, driveways, decks and other surfaces will help wash away the pollen, algae and other pollutants that cause springtime seasonal allergies. All slate roofs when cleaned properly with a low pressure system and the correct detergents will bring back the natural beauty of slate. Never let someone use a pressure washer or surface cleaning machine to try and clean your slate roof. This will only cause irreparable damage to your existing roofing material. At Pocono Non-Pressure Roof & Exterior Cleaning we have been servicing all roofing materials since 2007. This includes not only slate but metal, asphalt and cedar shakes as well. Our staff is actively involved in our industry on a daily basis to enable us to provide the most cost efficient services to our customers. Our slate roof cleaning service areas are listed below for your perusal. We are available to provide not only roof cleaning but an array of exterior services to include but not limited to residential and commercial exterior soft washing, pressure washing, gutter clean outs, gutter brightening, exterior rust removal, graffiti removal, gas station/convenience store canopy cleaning, fleet washing and playground cleaning. Please contact us at 570-994-6918 or visit us on the web at www.poconoroofclean.com. We provide free quotes and consultation at your convenience. Spray Wash has the distinct honor to clean the regions's most prestigious cancer treatment center. The TMH Cancer Center is approximately 60,000 square feet. services we provided at this facility included Roof Cleaning, exterior stucco cleaning, efflorescence removal, window cleaning and pressure washing of all concrete. Spring is fast approaching and with it comes the need for the cleaning of your storefronts. The sidewalks and entryways took quite a beating this past winter and are now showing the signs of all the grime buildup and the left over salt residue that was used in keeping your sidewalks ice free all winter. 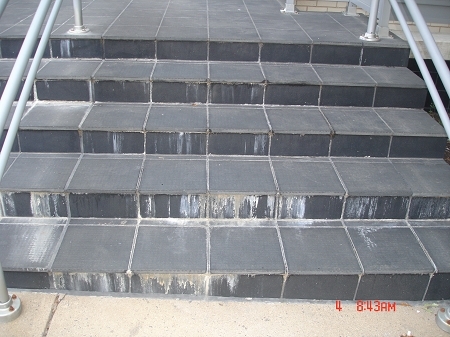 Luckily for you, we here at Roof Cleaner also provide the best in pressure washing services for commercial properties. We have the training, knowledge and proper tools that it takes to bring the luster back to your place of business. Here in the Grand Rapids, MI area we use a lot of salt to keep the ice and snow off the sidewalks all winter long. That entire residue needs to be cleaned off the sidewalks not just so you no longer have it being tracked into your store or restaurant, but also to help protect the cement as well. Leaving the salt to sit on the concrete can cause damage to the surface causing pitting of the sealer, which can lead to having to replace the sidewalks. Call Roof Cleaner at 616-240-3465 to get on the schedule for the pressure washing for the spring cleaning of your sidewalks and entryways, your customers will thank you. While we’re at it we can also clean the windows with our pure water window cleaning system.